1. Trying to get a midweek swim in meant I was biking over to the pool just as the skies open up. I arrived, pre-dampened, to find the pool open and uncrowded and the water warm compared to the air. 2. After several hours of early morning garden work, I want some food and to recline for a while. I find both at the Georgetown Waterfront Park, where I eat an ice cream sandwich made of blueberry ice cream and chocolate chip cookies and then doze for a couple hours on my blanket in the shade. 3. Everyone else has other plans on Friday and Rudi and I consider bailing on the Yards to do something closer to home. Finally, we decide just to go and are pleased when we arrive. We mostly have the pool area under the bridge to ourselves, we can hear the music clearly from across the park, and we feast on cheese, hummus, bread, tomatoes, figs, and blackberries. 1. Our freezer came unlatched while we were out of town (I probably failed to make sure it was shut all the way when I threw a couple things in right before we left) and as things melted, they shifted, which meant a big mess when our friends John and Nicole stopped by to feed the cats. The container of homemade ice cream ended up on the floor, but because it was made of Pyrex, it didn’t break and leave glass shards all over the kitchen. 2. Finding a pair of teabags in the desk drawer when I thought I was out. 3. After a stressful day and strenuous yard work, floating in a nearly deserted hotel pool beneath a waxing gibbous moon. Category: three beautiful things. There is/are Comments Off on pyrex, emergency stash, and moonlit. It’s been a long day and I want nothing more than to sleep, so I’ll make this fast. 1. A black sports car drives past sporting a plush, hot pink mustache on its grill. 2. 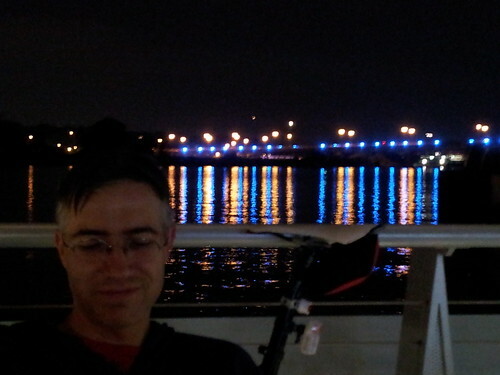 I decide that the night is too fine to head right home, so pedal behind the White House, rather than in front of it. I’m rewarded for my exercise with the sight of Marine One landing. 3. When a breakdown en route to the airport causes us to miss our flight, Delta’s counter employees in Baltimore and Detroit are ridiculously helpful in getting us onto the only planes that will get us to Salt Lake tonight. Category: three beautiful things. There is/are Comments Off on hipstermobile, commute, and help. Significant events inspire momentous change. Folk singer Ellis Paul wrote a song when he and his wife were expecting their first child, “Nine Months to Fix the World,” that talked about his need to make the world a better place for his new infant. Ebeneezer Scrooge saw the past and the future and decided to turn his life around. Six months from today I turn 40. And I want to be a different sort of 40-year old than the adult I’ve become. A couple years back it occurred to me suddenly that my teen self would be highly unimpressed with the thirtysomething me. Oh, she’d give me props that I’d made it this far. I was a depressed kid and could never visualize an adulthood for myself, so to be approaching 40 would have been significant from that perspective. But what I’ve done with the past 20 years would not have impressed her. I’ve spent far too much time coasting, treading water, allowing my life to be shaped by the currents around me, rather than being an active player in it. Sure, I have Rudi and my family and friends, some for decades now, who give my life flavor. I’ve done a couple of things in my professional life that are worth counting in the positive column, and certainly the organizations I’ve worked for have done good works. But I’ve allowed any dreams I had as a teenager to wilt. And I haven’t planted new ones to replace them. I haven’t worked hard to improve the world around me. So I’ve been taking steps to right my course. I started playing volleyball again once a week. I’ve been exercising more, trying to bike places more and to eat better (most days). And when an online friend decided to offer a course aimed at improving your writing practice, after some deliberation and angst (and nausea), I signed up. I’m three days in and just received the assignment for tomorrow. In it, Amanda included a quote from author Anne Lamott, who mused about how the act of writing is its own reward. And suddenly I remembered I used to feel that way. I haven’t in a long time (although I do sometimes love having composed something). And I’ll be interested to see if I will again. So I’ll be writing 15 minutes a day five days a week for the next while in an effort to see if putting pen to paper (or fingers to keyboard) has a place in my life. Because, honestly, if I don’t, if writing doesn’t hold a spark for me anymore, it’s time to let it go as a dream and to figure out what I do love. Because life is too short — and too long — to keep doing things unquestioned or to stay the course when a change in direction will lead to a better destination. Forty isn’t the end of the road, but it is a pretty good mile marker. I’ve got six months to make my teen self proud. Starting … now. I told myself not to forget the thing that early in the week I thought would make a good addition to this list. But as so often happens, it slipped my mind. It’s a possibility it will come back as I write, that my memory is locked in my fingertips somehow and it will burst forth into the keyboard any moment now. It’s also possible that it will return after I hit post, just to laugh at me, Nelson-style. Or perhaps it’s flitted off into the ether, leaving only its echo behind to mock me. 1. A beautiful, sunny, unseasonably temperate Sunday afternoon in August spent with Rudi at the pool, in the garden, and sprawled on a blanket in the park. 2. Rudi’s friend Chris won tickets to a Nationals game and invited us to join him at the park. The seats were close enough to the field that we could see Bryce Harper’s every grimace, that one of the coaches traded a baseball for a snack from the kid sitting in front of us, and that the ball girl was wearing a white sports bra under her jersey. I mean, if you’re close enough to pick up on someone’s undergarment choice, you’re close. 3. My best friend of 22+ years (Wow. I hadn’t done the math recently. We are old!) suggested that I could call her if I found myself without other occupation on Saturday night. Honestly, a couple hours with her on the phone is better than almost any other way I could spend an evening, save, of course, for spending it with her in person. Nope, it didn’t come back. But those three are good, too, don’t you think? How about you? What can you recall that’s been beautiful in your world this week? Category: life -- uncategorized,three beautiful things. There is/are 2 Comments. Back in June, when I was participating in the Armchair BEA, a number of events and blogs had giveaways associated with them. I am a sucker for a contest, and so I entered some of them. And I won a few of them! From them, I won Dead End in Norvelt by Jack Gantos (donated by Macmillan Children’s Publishing Group) and ebooks of J.B. Lynn’s The Hitwoman Gets Lucky and The Hitwoman and The Family Jewels (donated by the author). 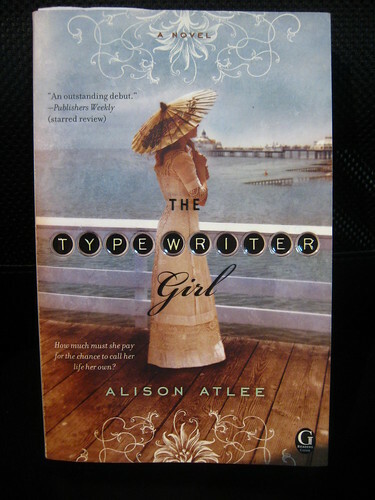 And from Always with a Book, I won Alison Atlee’s The Typewriter Girl. 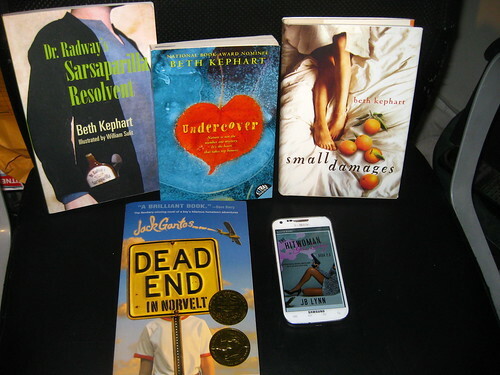 Thank you to all of the prize donors and book bloggers who generously offered giveaways and picked me. I am truly grateful and am looking forward to reading all these exciting books.